There are a huge number of shooting drills out there for every skill level, but as with any hobby or skill, the basics are the most important. Without basic proficiency, one cannot become competent, let alone get actually good. Here are three shooting drills for handgunners that are great for beginners and experienced shooters alike. These are about as basic as it gets, but these drills are practiced by experts, professionals and amateurs alike. The first shot drill is basic: you start with a loaded pistol in your holster and your hands off the gun. Draw the pistol, assume a shooting stance, aim and fire one shot at your target. The value of this drill is fairly obvious, since it's practicing defensive shooting. A concealed carrier (or open carrier) may have to draw and immediately fire. Thus, it behooves one to practice this skill. If you're going to carry it, you may as well have a quality gun belt and you may as well know what to do if you have to draw your firearm. The goal is decreasing the time required to go from rest to putting a shot on target, which is good for defensive shooters and competitive shooters alike. Start slow and smooth; speed will come. When you learn how to do basically anything, always start slow and smooth so you learn how to do it right from the get-go. The maxim "slow is smooth and smooth is fast" applies. Want to track progress? Get a timer. Want to get in draw practice without needing to be at a range? Get a snap-cap and incorporate the first shot drill into dry firing practice. Just make sure you've cleared your gun of all ammunition first. The double tap is one of the most widely practiced shooting drills in existence. It's hard to get much simpler than the double tap - you put two shots on target in the quickest succession possible. Just as with the first shot drill, if you aren't used to doing it then you'll want to start slow and perfect, and build up toward double-tapping with speed. The double tap is valuable as it gets a person used to delivering follow-up shots. One shot may not be enough, which is why so many people have been taught this drill over the years. However, some experts question the value of the double tap. A person is training to only shoot a target twice, and two hits may not be sufficient to bring a person down. It's certainly true; numerous documented shooting incidents exist wherein a police officer or citizen defending themselves emptied an entire magazine into someone and they still kept coming. A person should, the argument goes, actually shoot until the threat is down. In that light, a double-tap may be a good drill for a beginner; once proficiency is gained, shooting drills with longer strings of shots should be practiced. Want to spice up the double tap? Add it to the first shot drill so you draw and fire twice. The Mozambique Drill is a corollary to the double tap, as the Mozambique is a double tap to the body and one shot to the head. 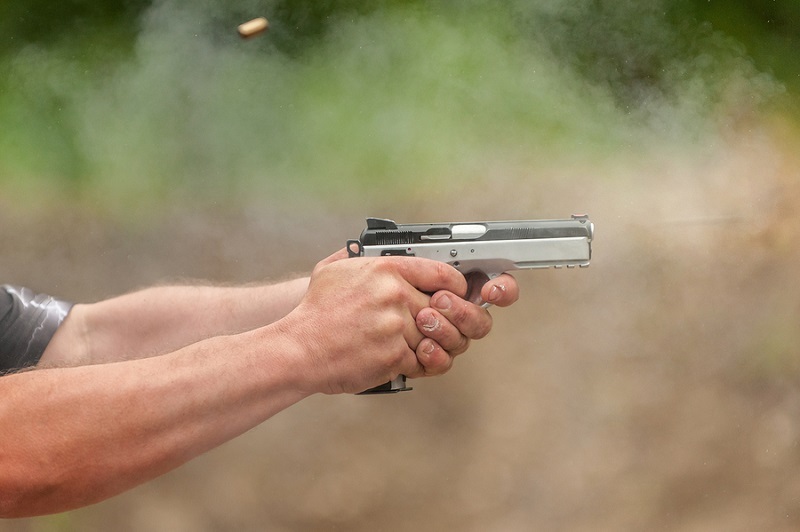 This drill, as with so much regarding pistol shooting, was popularized by Jeff Cooper. The story goes that a mercenary acquaintance of his was employed in Mozambique when that country liberated itself from Portugal during the 1970s. An enemy soldier came around a corner, and the mercenary employed a double tap. When this didn't stop his adversary, he aimed a third shot to the head and stopped him. Cooper started teaching it to his students, and two of them taught it to the LAPD and it spread from there. The LAPD renamed it the "Failure drill" or "Failure To Stop" drill. The idea is to put two shots - a double tap - in center mass, pause to see if the target is down, and then deliver a headshot which would ostensibly be fatal. This is taught by professionals to professionals, so naturally it's a great drill for defensive shooting. However, it also requires accuracy, since the third shot has to be more precisely aimed.